His years-long project Twelve is nothing but another attempt to conquer silence, the massive calm that has descended like a fog on the lives and works of the longest-running family art workshop in Europe, above Dimitrije daskal, his descendants, and the descendants of their descendants.....Thus it continues, from the 17th century to the 21st, till the twelfth, Aleksandar. I keep imagining the huge, seemingly unclear, damp calm and I envisage the scenery and time in which they work, and do their job with the "sinful hands"; I recall all the stories, escapades, incidents and events which followed this expedition; I relive in my mind the incredible Dubrovnik adventures full of okays and no-nos, staircases which I heard Aleksandar Rafajlović talk about; I evoke stories which could make a novel, and in a way, this exhibition, The Twelfth seems to one because Aleksandar Rafajlović knows how to laugh. He knows how to laugh in the face of oblivion and tranquility, knows how to bring together time, places, journeys into Sense. Words are, indeed, too confined to describe each life, silence too big, a photograph a mere fragment, but laughter and joy, following a job finished despite numerous absurdities, cancel futility and prove that art does make sense, always. Aleksandar Rafajlović, whose name could very well be the Cloud of Sense Laughter and Joy, knows this only too well. It was in the early spring of 1992, just as the civil in Yugoslavia war was breaking out, that Aleksandar Rafajlović, Mirko Ognjanović and I started painting the iconostasis for Saint Sava Serbian Orthodox Cathedral, in Cleveland, Ohio. How we got to do this job is a long story. We never, actually, understood it completely. 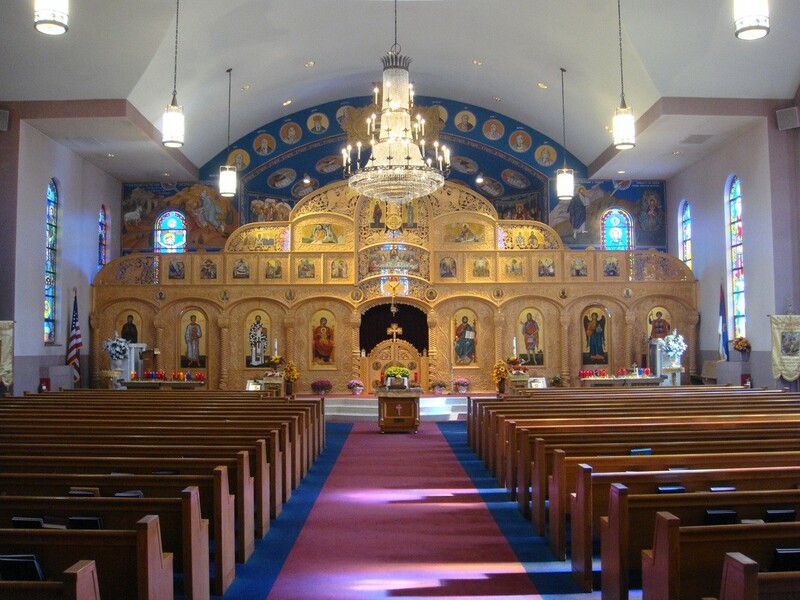 The Serbian Orthodox Church in America commissioned the iconostasis through intermediaries who approached one team of painters, then another, and then came to us. There was a man in charge who, we guessed, made all the decisions and did the mediation generally. The iconostasis was to be made from beech-wood. It was being carved, somewhere in the country, by some patient and skilful craftsmen and it was expected to be 26m wide and nearly 18m high! At that time it was the largest iconostasis that any Serbian church had; even bigger than those in St Mark's Church, or Dečani, or even Chilandar. There are probably larger ones today. Our part of the job was to paint icons; 42 icons of different formats with the total of 147 images, one donkey and one fish. We had no idea how icons were painted. We did, however, remember something from the classes about painting technology, at the Art Academy, but hardly had any experience or awareness of the volume and complexity of the task. First several weeks, unaware of what we were getting ourselves into, we spent working in my studio. It was all very hectic; a promotion of some kind was scheduled as well, something that required at least eight pieces, all ready and waiting. And then, there, in a small house in Senjak, we managed to paint the throne icons, the largest ones found at the bottom tier of the iconostasis, each measuring 80 x 180 cm. (We thought we had painted them but, later, as we broadened our knowledge, we painted them over.) My studio was small so we would take the finished paintings into the yard, allowing the lacquer to dry but also to see better what we were doing. The room was far too small for three easels so one of us worked in the kitchen. I recall those days as my biggest success as a painter; women from the neighbourhood dropping in, the word being spread, the women looking at our painting and crossing themselves! We tell them that the three of us made them, looking a mess and covered in paint, just now, a little while ago....But to them, it's like they fell from the sky! An odd woman drops a tear. Isn't this the utmost a painter can achieve? We soon moved to Aleksandar's house and his studio. We stayed there the following four months: we slept, we ate, read to each other there – we painted day and night. Friends came to help, bringing gold leaves and pigments, revealing secrets and tricks of the trade. Priests and art historians visited and described the scenes. In the end, even our wives worked with us. Every other day, one of us had to go to the market and get two dozen eggs. While two of us were painting, the third was reading aloud, from the Painting Technology by Živojin Turinski, or the Bible, finding descriptions of the same scene in all four gospels, or comparing compositions from monographs on Sopoćani, Giotto or Masaccio. Some of the commissioned scenes were not known in Byzantine icon painting. So, our task was to invent them, and make them look like they were copied from Mileševa or Studenica! We had several serious rows. On one occasion we stopped working because of aesthetic and scholastic disagreements. Each figure is different and clad in a dress of a particular colour so as to be recognized in another scene, by the colour of the dress. Each dress is draped. And each figure has hands and feet, each hand and each foot has nails, and each nails has a glow. It is also clear whose beard is white and whose is black, who has gray hair or who is bald. The news on the radio, which is always on, is all about the war and artillery shells in Sarajavo, Vukovar, Dubrovnik, then again in Knin, Mostar, Banja Luka.....And we all have a friend or family in some, or all, of the places. The three of us know the whole of Yugoslavia! Whichever one of us went to get the eggs from the market also came back with an armload of papers which he read the news from until we all became sick. We then switch the radio off and ban the news reading. We bury our heads in silence, in the glow on the nails, in a pleat of a draped dress, like three blind men. I can't decide, yet, whether this job saved me or ruined me. It's been over 20 years and I still speculate as to what would have happened to us had we not agreed to do the iconostasis. Or if it had never touched us, or we had never heard about it! Would I be living here where I do, and would I be what I am now? I still don't believe in God and I ask myself: did we do the job for God or did God do it for us? We've never been paid for the job. None of us has. The organiser managed, through certain intermediaries, the Church, even the UN, to arrange the export of one shipload of woodcuts and icons into the USA while the strongest sanctions were still in place, in the summer of 1992. He also organized, at the same time, to send out himself and his family. He never came back from America. I am not sad about the money though. I am only sad that - after we finished work and after all the gold was glued and everything lacquered - on the night of the transport to America we realized we didn't have a single photograph, and we also didn't have films for the camera. Mirko Ognjanović got into a car, went to get a camera and, somewhere, in the middle of the night found, or borrowed, slide films. We shot all the pictures individually and together. I remember lying, just before the dawn one morning, and posing on the floor with the icons scattered all around me. Mirko climbed onto the piano and took pictures of me, as if baptising me in the river Jordan surrounded with saints. It was impossible to have films developed in Belgrade at the time, because of the sanctions, so ours were sent to Vienna where, somehow, they went missing. That's how we were left without the photographs, too. When I open the eyes, I always have the same view before me. On the right side of the wall sits a white face, made from shells, with a huge blue eye and a stretched cloth ribbon resembling a tiny body. More joyous than threatening, it is there to welcome the spirits of the ancestors who arrive to Ouidah usually at the weekend, at dusk, with punishment, encouragement or just reminders. Higher up, to the right, is a blue picture, made for tourist in the likeness of hairdressers' shops where hair is cut under an electricity pole from which power can be stolen. One female and two male faces, only one smiling, but all three noticeably whitened. A nice life in Africa is usually white. Up there, to the left, is a clutter of black spots and dotted lines, heads and hands caught up in a crowd. There's something odd about this canvas. It would look like a picture of rebellion were it not for everybody moving in a different direction. On the far left, an ancient Papuan face with a stingy smile is sitting nicely in a black trapeze. 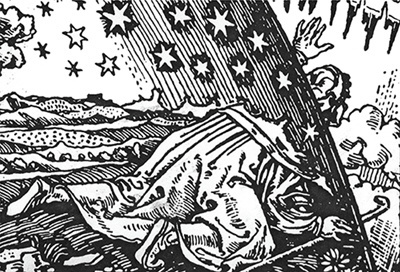 Imbued with the sense of melancholy, seems to be enjoying the union with God and the survival of self-destruction. Four work pieces from the land of the black people (where artists remain nameless) make a roof over a happy Portuguese face which Twelfth discovered in a cemetery somewhere in Portugal. The face awaited him at the end of the alley of gaiety, with strings of frozen moments of happiness glued to the white marble. With a contagious smile, a loosened tie and mischief written all over his face, the picture that each of my day has been starting with for a long time was now seeing Twelfth off and out of the Portuguese street of eternal joy. Death in the Balkans was different then, black and ugly, ever-present and calculated in large numbers, although dying happened far from the messy white city, ill tempered and somewhat anesthetised. Twelfth and his rascal on the white marble came into our bedroom after the wars, and after death moved from the front pages to the crime and disaster columns, and obituaries with faces of life frozen at the wrong moment. Portugal didn't go to war. Above the cheerful oval face and the white marble are two ribbons showing bluish sky. The picture of death has been changed into a picture of joy of life and of "the other side" as an overall existence bathed in the light and whiteness. What a perfect illusion for the time of solitude, failed ideologies and futile promises of milleniarism! 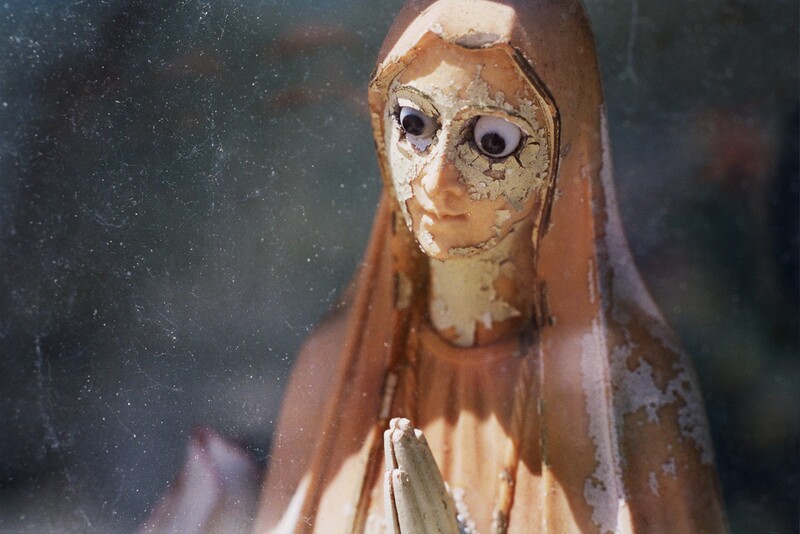 Salvation is replaced by escapism of art into the white cemetery alley. Before I switch the light off, I always have the same view before me. Above the headrest, as a farewell to a dream, is a picture of Mother of God nailed into the plaster wall. Although quite tatty, it's still beautiful, comforting, with the hands clasped in prayer and the look radiating cheerful repose. Nothing has changed since the news that history died was heralded. Living without the illusion of redemption is hard. It was made early in the morning; lit by a ray of sunshine with banished darkness barely discernible in the background. Her calm bares a veil behind which is a divine machine left there to do a job for us, making pleas for what always manages to escape somehow, even when we are sure it's within our reach. In the alcove, all alone, she offers promises of a better world to the living, and works hard so that the dead get to the right side. Her face is peeling, but the wear and tear makes her appear even more convincing. She sends a message out that there is someone who makes sure that we get to the right side once the life marked with fears and prohibitions is over. That is why her image is at the beginning of the road of promised joy, the road to death seen as the inauguration of a real life. Eternity always seemed rather unconvincing. 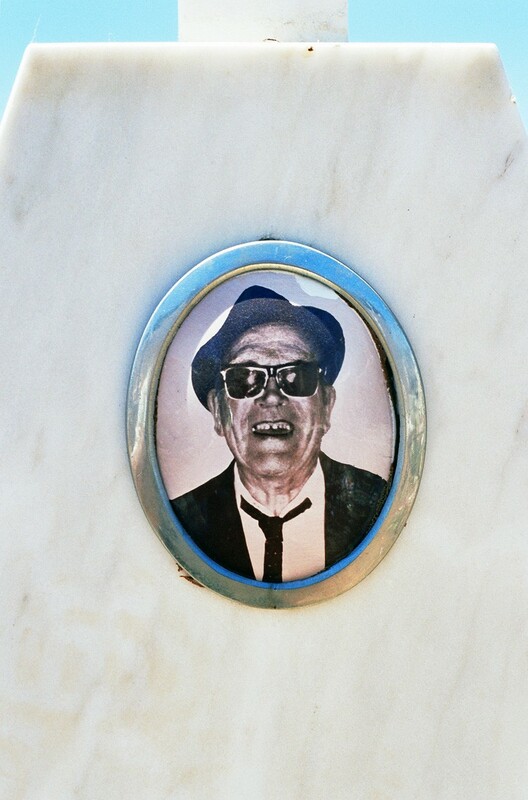 I haven't succeeded at embracing the illusion of salvation which is brought to life through cheerful faces, Portuguese cemetery bathed in dappled whiteness, and stone deities guarding it. Twelfth gave me a present; a painting of sweet melancholy, my oceanic feeling. I put the book down, switch the light off and brace myself for a dream. Because, getting quickly to all those remote and often secluded destinations, meeting church guardians, bringing icons out and exposing them to the day light, photo shooting them, placing them back.....It was not considered impossible but it resembled an adventure with an unknown outcome. What he did, every time he came, was fascinating because of the gifts he would bring with him. After saying hello, he would present me with several copies of neatly packed DVDs with explanations - for me, the Institute's library, the associates. They comprised all the photographs, with legends sorted out, of the works from the Boka Kotorska School of Icon Painting that had been collected up until then. When I saw the two top tiers of Rafajlović's imaginary iconostasis, I felt the same kind of passion which sent me 25 years back in time, to the Picasso Museum in Barcelona. Having seen his early budding works, I saw now his interpretation of Velázquez and his Portraits of the Infanta. The top tiers of the iconostasis are dedicated a) to the prophets and patriarch from the Old Testament or the twelve sons of Jacob, and b) to the twelve apostles. 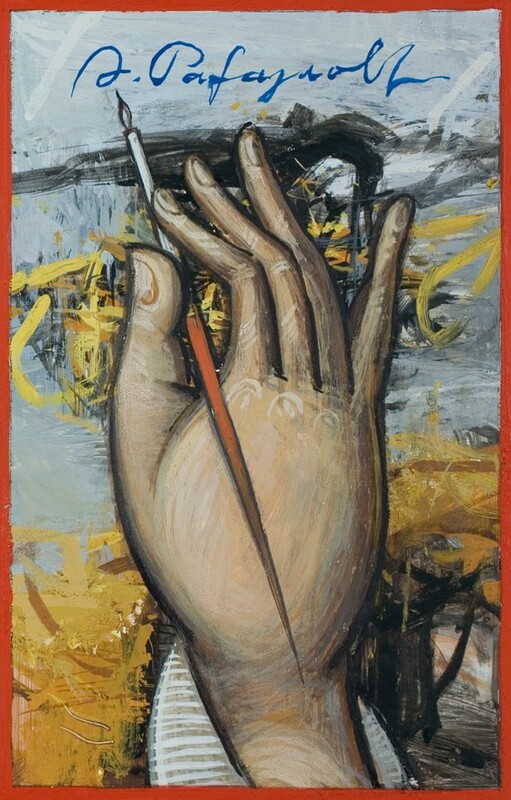 Both of Rafajlović's top tiers are dedicated to his eleven ancestors; painters from the icon painting school of Boka Kotorska, and to himself, Aleksandar the Twelfth. 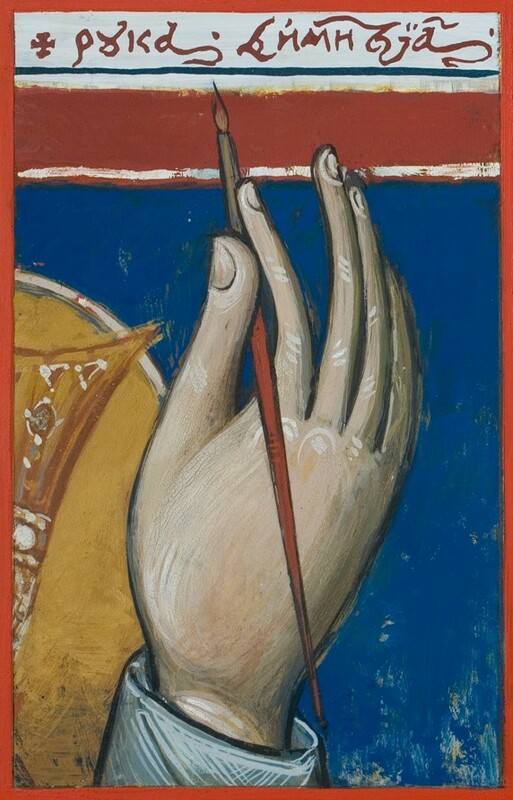 In one tier we see upper arms and hands with paint brushes hovering over particular fragments, in the other we see hands held in much the same way that Christ held his while offering a blessing – the palm upturned – the ancestors signing their names facing the observer. Since his first photograph of an icon, made by one of his ancestors and taken by him as a student, started a fever which lasted the past ten years, several thousand photographs have been made – of 600 icons, on 80 locations. All this is fragmentally presented on the display panels of "Expedition". 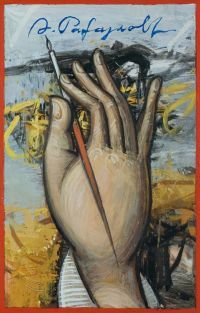 Artistic expression and ancestors' characters thus became an essential personality feature of the contemporary artist, while the homage resulted in the unique art piece coming out into the light of day and becoming the centerpiece of the "Twelfth". The very centerpiece delivers quite a delicate, almost untenable discourse: the narrative dispersed but the history of the artist's family nonetheless readable. Apart from the happy ending, attributed to the artist, satisfaction concerning the success is also felt. Preserving the expression of mimetic language in the work of art and the source of great fulfillment, in a way so radically ambiguous - yet the show never falls short in communicating sincerity - was quite a challenge. So, incidentally and unintentionally, the Twelfth tells us that the avant-garde is always simple a progressive, emancipated form of a bygone culture, the today coming out of the yesterday. If excitement and pleasure are experienced while we look at his work, it is because the work was born out of excitement and pleasure. Such sentiment and the artist's peculiar sort of enthusiasm over his expedition are taking us now, like before, through cemeteries, the blueness of the sky with one seagull, scorched and cracked earth, gondolas with the washing....This is how the artist, which Serbia's contemporary art scene cannot be seen without, paid homage to his ancestors in a very unusual way. Unlike the fatigued contemporary art, constantly making efforts to escape adjustments, here we see sincerity and eagerness produce a work of art, possessed of overwhelming and pervading drive, and with preserved ties to the culture which it stemmed from. Here we can look for, and find, ways to explain Rafajlović's creativity and his artistic vitality. We can be certain that time will add something to his art as it will take something out of other artists. Since viewing long video works is tiring, as is reading large texts, it is worth mentioning two reading styles that exist at this exhibition; both thought of by the author himself. One makes us go fast, the other misses nothing – it examines, sticks to the painting, icon, the show – we read with meticulousness and interest. People like him always make something big. If they were to cause damage, that also would be big. That is why his sort of people ought to be involved in art because any other way would be no good. When such people find themselves in the sphere of spirit, it generally ends well because the spirit is usually generous and shows them directions. And that is when we can unwind. Eyes of the people like him are always hungry for something beautiful, seeking a detail, a visual understanding of things, a small séance, always making time for everything. Even if things appear small and insignificant at first, he will change them into something big and intriguing so they will be worthy of his, and our, attention. People like him are compelled to create before their very eyes. Art must happen to them. Then they resort to minding their own business. People like him don't make photographs because they don't see the world with the eyes of a photographer. They see paintings everywhere; they make paintings even with a camera in their hands. He knows that whatever is on display in his paintings is to be found in the shop of his photographs. People like him are rather difficult – they usually know what they want and insist on having things their way. In this country it is a rare and undesirable quality and individuals that possess them are usually avoided. Society such as ours can't stand people like him, nor can it understand them. People of his kind can be difficult to get on. What's worse, they are forever disgruntled. Still, however insane this may sound, people like him move the world. I'd better not think what might happen if people like him decided to dedicate themselves to dealing with facts, numbers, or perish the thought, the law. With the hands a size too large it's a good job he isn't a butcher. He could be anything: stonecutter, baker, shoe maker, tire mechanic. He was down on his luck. With the eye of a portrait artist, trained for people's faces, he would have made a perfect concierge, priest, police investigator but, to our luck, he is none of that. When I see him sweet- talking to plants, like a proper gardener, my brain starts pondering. He understands herbs in much the same way as he understands pigments. This is him; in much the same way herbs and pigments are, too. Discipline, meticulousness, perseverance is what he is about, together with his apparent desire for equal distribution of justice and truth, if possible. People like him can talk for a long time with the same passion at the end as in the beginning. They see a story in all things, everything has a narrative and the end happens when the time is right. As much as he likes to talk, he also likes to be heard. People like him enjoy our attention. Luckily, there aren't too many people like him in Belgrade: in fact, they are fewer than the official statistics reveal. About ten. But, that is more than enough. Such people should be given everything in advance because, sooner or later, they earn it anyway. People like him burn their energy all day long. I guess they sleep at night. When they perk up, and how, remains a mystery. People like them are restored by an unknown force. The force isn't visible to the naked eye. It isn't to be found on the Net or in the sky. Officially, it doesn't exist. Even its reserves are not known and remain a secret. However strange this may seem, he can be loyal. I've never heard him apologize. His wife will love me for these words. When giving advice, he expects you to take it the same way our neighbours receive communion: swallow it with open mouth and closed eyes. To people like him a task feels like a uniform, a perfect fit. His duty recognizes only what must be done because whatever might need doing, even in the face of difficulty, ought to be possible. Everything he gets involved with touches on the borders of the possible. Such people find sense in it, and are moved and motivated by it. They are, unsurprisingly, their own executioners and expect the best from themselves. Only someone like him can think of turning his family history back a few centuries, and dedicating 10 years of his life to studying his ancestors - painters. Namely, the day he spent visiting churches around Boka Kotorska, he decided to embark on the task and put together the known material, that which existed somewhere but lay undiscovered, scattered about and detached, he also decided to put them all back in their deserved, but vacant, place in the history of art. For people like him, exhausting and long-lasting jobs are more than a challenge. This was exactly a job like that, the one that awaited someone like him to see to it. With this exhibition, the ten-year enterprise, including visits to churches, museums, collections, will soon draw to a close. When people like him finish a job, they get what they already knew at the time they were starting out. We have here a most comprehensive documentation on Boka Kotorska painters. 13.000 sorted photographs. For the first time, almost everything made by his eleven ancestors -and preserved to the present time - is to be found in one place. Let's be clear; he made it because of the way he is. People like him always do their best, whatever task they set out to do. It is debatable whether a state institution would be capable of doing what he did. Luckily for us, he already knew the answer. When I told him that I was going to write a piece on him, he phoned me day after day, without fail, to check my progress. Although I know a man who is like him, maybe even better, shan't discuss him now. I know people like him very well and, since I find myself in the same cage with him, I try not to touch his lunch bowl. This should be it but it isn't; far from it.